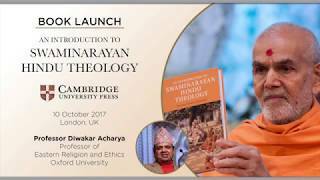 Cambridge University Press, the world’s oldest publishing house and one of the most reputed academic publishers in the world, has released An Introduction to Swaminarayan Hindu Theology, a 350-page book in English on Akshar-Purushottam Darshan. Authored by Paramtattvadas Swami, An Introduction to Swaminarayan Hindu Theology provides a comprehensive doctrinal account of the Swaminarayan tradition’s belief system, drawing on its rich corpus of theological literature, including the teachings of Bhagwan Swaminarayan himself and classical commentaries on the three canonical Vedāntic texts, the Upaniṣads, Śrīmad Bhagavad Gītā and Brahmasūtras. Part 1 of the book delineates the sources and tools of Swaminarayan Hindu theology, while Part 2 systematically expounds upon its distinctive five eternal entities – Parabrahman, Akṣarabrahman, māyā, īśvara and jīva – and mukti (spiritual liberation). In presenting these key themes theologically and lucidly, Paramtattvadas Swami makes the Swaminarayan Hindu belief system intelligible to scholars, students and serious readers. Hailed by Cambridge University Press as a “landmark publication”, the book has already received high critical acclaim from leading international scholars. Below are some of the academic reviews and endorsements received thus far. An Introduction to Swaminarayan Hindu Theology is a ground-breaking book that will be widely appreciated by scholars and believers in India and the West. It is a welcome addition to the growing field of Swaminarayan studies, distinguished by its clear focus on the teachings of the tradition, with close attention to philosophical and theological foundations. 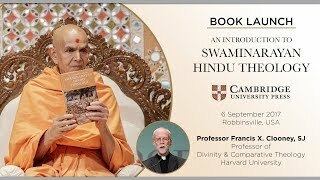 Written by an erudite insider and practitioner, it is an excellent example of Hindu theology, as Swami Paramtattvadas speaks with the authority of his experience, practice, and so too with the benefit of many years of traditional learning as well as study in Western academic settings. The book also exemplifies constructive religious thinking, as he points to areas where new thinking is required, to understand ever more deeply the mysteries of God and scripture, the human and the world, and as the Swaminarayan tradition grows globally in the 21st century. Swami Paramtattvadas’ work will be prized by members of the Swaminarayan community, by scholars interested in contemporary Hinduism and in the self-representation of faith traditions with an increasing global presence, and by theologians of all faiths committed to the global interreligious conversation. Swaminarayan Hinduism is rapidly becoming the most prominent form of Hinduism in many countries. This constructive presentation of Swaminarayan theology is an essential text for Swaminarayan and Hindu studies and a valuable resource for comparative theology and interreligious dialogue. Swaminarayan developed a theology, an ethical discipline and a reform movement in a time of rapid social and political change in the early 19th century that continues to inspire and guide Hindu followers in the 21st century. Contemporary migration movements expand his influence across strong transnational networks and through social media in cyberspace, making this book even more relevant in helping us understand what this dynamic global community believes. 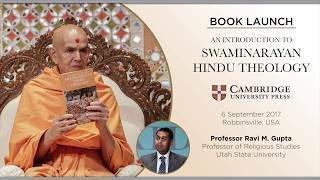 Swami Paramtattvadas’ Western education at Oxford and classical Hindu studies in India enable him to present this important Hindu theology with academic rigor, depth and clarity. His introduction is an accessible and major contribution to the study of modern Hinduism. In this welcome introduction to Swaminarayan Hindu Theology, Swami Paramtattvadas has succeeded in presenting the fundamental beliefs of his tradition in a lucid, meticulous and methodical exposition. This book, while standing within Swaminarayan Hinduism, seeks to engage with a broader, rational discourse and to stimulate discussion beyond the bounds of Hindu communities. The writing of this book has been a large scholarly task, aiming to systematise key themes from an extensive network of the tradition’s authoritative texts in Gujarati and Sanskrit. As such it is an important contribution to Theology and Religion and, to my knowledge, is the first Hindu systematic theology written in English. It is also a welcome contribution to Hindu Theology and to the emerging discussion of Comparative Theology. I am sure it will find a wide readership among both the academic and Hindu communities. This book provides a brilliant introduction to the theology of the Swaminarayan tradition, one of the most dynamic and visible forms of Hinduism in India and abroad. It comprehensively narrates the key doctrines and beliefs of the tradition drawing on canonical Hindu texts, original teachings of the tradition’s founder, and exegetical works of other teachers of the tradition. After delineating the sources for his research, the author intelligibly expounds upon the five central entities of the tradition. It also opens vistas of mutual understanding and comparative studies with other religious traditions. The book stands as an essential tool for understanding the belief system of this vibrant Hindu tradition. In this engagingly written book, Swami Paramtattvadas looks at the complex ways in which the Swaminarayan tradition interpreted the critical and hallowed terminology of Vedānta, thereby developing its own unique system from the early modern period onwards. At the same time, by approaching the thought of the tradition from within, he also raises interesting questions about the relationship between the categories of theology, metaphysics, the philosophy of religion, and the practices of Hindu devotion. This book does an excellent job of bringing the Swaminarayan tradition into conversation not only with English-language studies of modern Vedānta, but with comparative theology more generally. This monograph by Swami Paramtattvadas fills a longstanding need for a detailed and systematic exposition of the theology of the Swaminarayan tradition. It makes accessible the fundamental theological assumptions and claims of the tradition, while contextualizing and discussing these within the rich diversity of Hindu intellectual thought. The author brings to his exposition both the depth of traditional learning and practice as well as the tools of contemporary Western scholarship. This is an excellent contribution to the field of Hindu theology exemplifying the creativity of commitment and critical inquiry. It is a valuable resource for understanding and engaging with one of India’s most visible and rapidly growing global religious traditions. An Introduction to Swaminarayan Hindu Theology is a ground-breaking work which provides a comprehensive theological overview of the belief system of the Swaminarayan tradition, one of the fastest growing and most visible Hindu groups in India and in the west. The book indicates the author’s deep immersion in traditional Hindu styles of theological reasoning and also his ability to situate the themes of God, humanity, and the world within the wider frames of ‘Hindu theology’ and ‘comparative theology’. A key marker of a religious tradition’s health is its ability to articulate, renew and reapply its doctrines and scriptures for each succeeding generation. This is the work of theology. There is still a great dearth of Hindu theological writing in English that takes into account our global, interreligious context. Not only does this book offer a superb example of such writing within the Swaminarayan tradition, it also issues a call for others to join the conversation and grow the field of Hindu theology. An Introduction to Swaminarayan Hindu Theology provides a thorough, balanced and incisive analysis of the tradition’s key sources, doctrines and practices, written in a clear and accessible style. I commend Swami Paramtattvadas on this signature achievement. An Introduction to Swaminarayan Hindu Theology was officially released in the presence of His Holiness Mahant Swami Maharaj in Robbinsville, USA, on 6 September 2017, and again in London, UK, on 25 September 2017. Esteemed members of the American and British academy were present, as was Michael Duncan, Senior Global Marketing Manager for CUP, from New York. Below are a few excerpts from the scholars’ addresses at the respective events. Professor Ravi Gupta (Utah State University, USA): “An Introduction to Swaminarayan Hindu Theology is a singular achievement on many levels. “First, the basics. This is the first scholarly work in English to provide a comprehensive introduction to the ideas that make the Swaminarayan Sampradaya unique among the Hindu traditions. The book is systematic in its approach, proceeding step by step through central ideas about God, human beings, and the relationship between them. Paramtattva Swami’s writing is clear and straightforward, and every term is well-defined, making the book accessible both to lay persons and scholars. Given the Swaminarayan tradition’s immense global presence, this English-language introduction provides invaluable insight for both insiders and outsiders into the heart of a major Hindu tradition. Shaunaka Rishi Das (Oxford Centre for Hindu Studies, UK): “The publication of this book is historic because it also marks the transition of the Swaminarayan Sanstha into a more modern environment. Scholarship has been going on in the tradition since the very beginning but now scholarship is translating itself into a different language, a different medium. Cambridge University Press is not a lightweight academic publisher. This is getting it into the heart-blood of scholarly discourse and, as has been said, it means that there is now a book that scholars and students can refer to when they want to learn about the Swaminarayan understanding of the Supreme. Paramtattvadas Swami was ordained as a sadhu (Hindu monk) in 1992 by His Holiness Pramukh Swami Maharaj. For twelve years at his seminary in Sarangpur, India, Paramtattvadas studied Sanskrit, Gujarati, world religions, Indian philosophy, Vedanta and, most intensely, the beliefs, practices, texts and history of the Swaminarayan tradition. Within the seminary, this culminated in the equivalent of two undergraduate degrees, in Sanskrit grammar and Indian logic, and a postgraduate qualification in Vedanta. In 2004, he completed a Master’s in Sanskrit from Karnataka State Open University before returning to England in 2006 to read for a Master’s in the Study of Religion at the University of Oxford. After a further year of pre-doctoral studies focussing on Christianity, he went on to complete his PhD in Hindu theology at the Oxford Centre for Hindu Studies and Maharaja Sayajirao University of Baroda, India, under the supervision of Gavin Flood, Professor of Hindu Studies and Comparative Religion at the University of Oxford. Paramtattvadas Swami has written and presented extensively at events around the world on topics related to Hindu studies, in general, and Swaminarayan doctrine, praxis and history, in particular. He is also a scholar at the Oxford Centre for Hindu Studies, a recognised independent centre of Oxford University. More details about the book are available on the Cambridge University Press website here.